This quick post will mostly consist of screenshots. As is my want, I like to present anti-vaccinationists in the wild; just so the community can see what lurks behind their ethically challenged claims and beliefs. 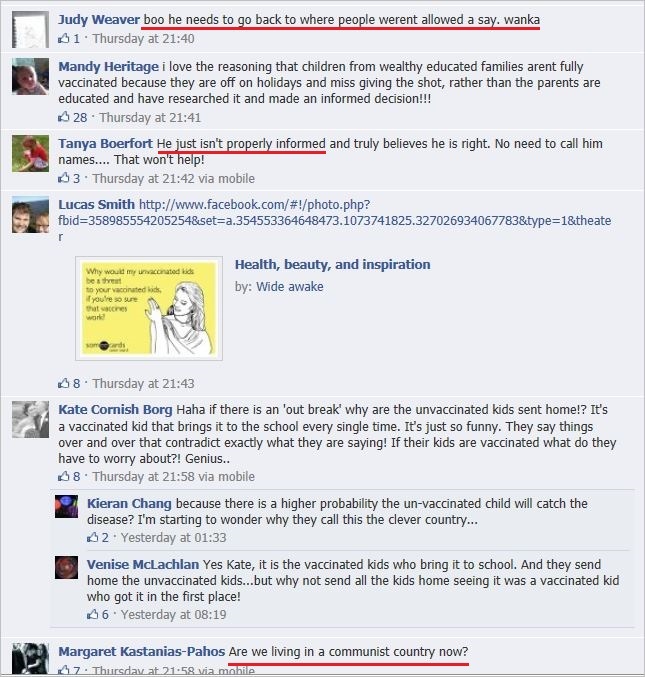 I keep getting told that most vaccine refusers are well-educated. I have to take this as the truth. Who am I to question social researchers? Personally, I’m yet to see any evidence of this claim. NSW opposition health spokesman Andrew McDonald had to call the police after a scathing speech he gave in State Parliament criticising the Australian Vaccination Network (AVN), a group which, despite its name, is anti-vaccination. Debbie says she was just trying to be a good mother when she began researching immunisation online. One of the first sites she found belonged to the AVN. ”It all looked legitimate, I thought ‘whoa, vaccines cause autism’, so I didn’t vaccinate my baby,” she says. But when she saw the tragic story of the death of Dana McCaffery, who in 2009 died at one month from whooping cough, she began asking questions. Now she argues on social media with anti-vaccination proponents and is too scared to reveal her identity because of the backlash she has received. AVN: covering themselves in glory. 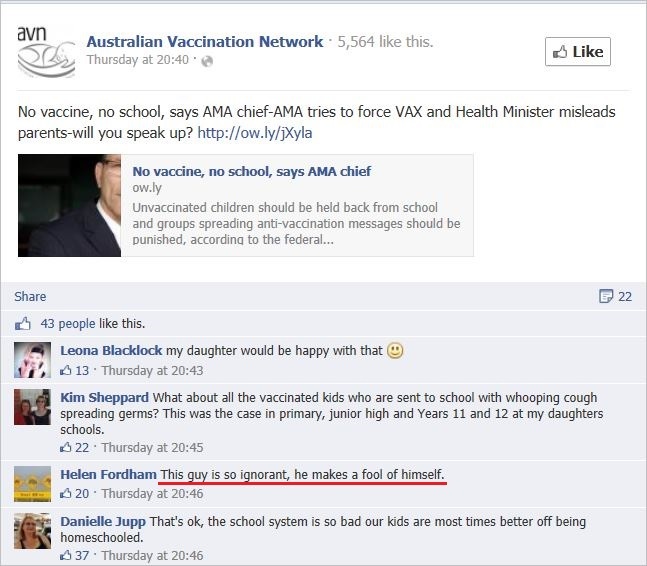 This entry was posted in abuse, anti-vaccination dishonesty, australian vaccination network, AVN, meryl dorey, stop the australian vaccination network and tagged abuse, AMA, Amy Corderoy, anti vaccination, Australian Medical Association, australian vaccination network, AVN, DoCS, Dr Steve Hambleton, meryl dorey, Sydney Morning Herald. Bookmark the permalink. All I saw was ‘Herp derp… herp… derp.’. The bits in before and after the screenshots weren’t too shabby, which is nice. (I picked up the Fast Show reference). Look at the things that scuttle about in the harsh light of day when you turn rocks over…. Melissa Sheere has the right idea. I think yellow arm bands for anti-vaxxers would be a good thing. If you see a crowd of people with yellow arm bands, you know to keep your children away from them. Have DoCS been informed of the death threats against their workers by Janis Ferguson? The internet is forever, and the proof is right here…. It is sad when someone puts up an internet meme and thinks they have supplied a reference. Mass vaccination did away the need to enact powers of large scale quarantine (sorry that’d be gulags I guess). 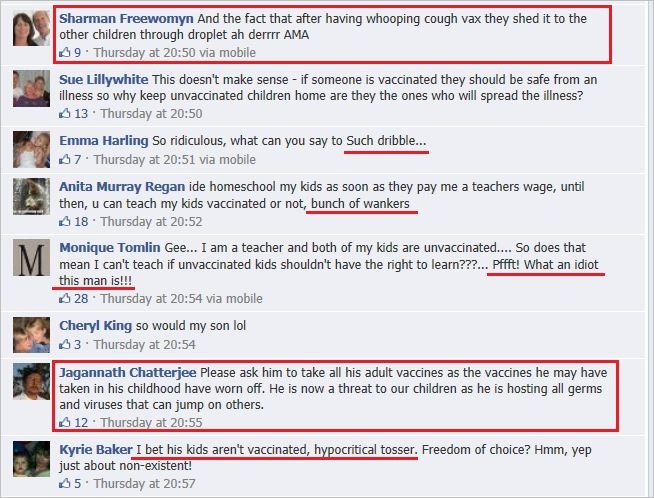 These rants really underscore the success of vaccines. There is a lot of evidence in their responses that their children would get no benefit from home schooling. These kids will need to learn how to thrive in spite of their parents. Unbelievable that this AVN rubbish should be imported to Australia ! You are doing a great job. Note the irony that this collective of freaks are the worst kind of aggressive self-righteous thugs but ironically see those protecting their children as the bullies. The AVN and Bressington deserve each other. They (the AVN cheer squad) keep telling us they’re educated. Their comments mostly suggest the exact opposite. The possibility that many of them even reached the lofty heights of Year 9 or 10 seems unlikely to me, and if so, they obviously didn’t pay much attention in class.